In late January 2018, a few friends were posting and sending me a link on Facebook: it was for a Kickstarter campaign for a French film called “Paris est une fête.” The video was neatly shot, with their main actress walking through Paris explaining that her group of friends had spent 4 years self-producing a film in Paris, and they were launching a Kickstarter campaign to raise about 10.000 euros to fund post-production. By the time their video had spread to my inbox, they had already smashed their initial target: they’d reached 50.000 euros in pledges, and were making the news in France. Everyone in Paris was talking about it and by the end of their campaign, they generated over 80.000 euros and had been contacted by several producers and distributors interested in collaborating with them. You can probably see where I’m going with this. I thought: okay, this is what I need to do. All my friends did, too, urging me to make my own Kickstarter campaign. And it seemed fair to assume that if their video could gather that much interest in Paris, my project had the potential to speak to people living in 5 major cities around the world. So even if I managed to generate, say, 20% of the exposure they got in Paris in each of those 5 cities, that would be a massive exposure boost for the project and a target I could reasonably set myself to achieve. ​So, as I arrived in Reno to stay with my Dad, I went into full “Kickstarter mode,” knowing that the goal here wasn’t so much to raise money (the money would still be useful to properly finish post-production and fund some promotion) but to get media attention. It was to announce this film to my target audience, get the word-of-mouth going, generate some press and hopefully catch the eye of the industry. The first two weeks, I educated myself on Kickstarter campaigns. I learned everything I possibly could on how to build a campaign, how to make it grow, do’s and don’ts, reading tons of articles called “Kickstarter 101,” “12 Key Strategies to launch your successful Crowdfunding campaign,” “10 tips I wish I knew Before I Launched My Kickstarter Campaign,” “10 Questions to Ask When Creating Your First Kickstarter Project.” From this, I learned that the pre-launch phase had roughly three missions. First, build the project’s social media presence. I created its Facebook Page, its own Instagram account, and a Twitter account for myself (I had never been on Twitter before). I invited all my friends to like and share them, and within a week I had a fairly solid 200+ group of people connected with the project. They would in essence be the “first responders” to the Kickstarter campaign and would serve as the launchpad to spread the Kickstarter campaign once it went live. Second, establish a full list of “media connections.” I didn’t personally know any, so this meant compiling all the different outlets that could be interested in a project like this. It also meant researching specific journalists and sketching out for each one a personalized reason to be writing them. What was the angle for them? I was listing websites, blogs, magazines, newspapers, forums, news channels, specializing in films (experimental, documentaries, no-budget films, science films, etc. ), in philosophy (free will, neuroscience), in physics (quantum physics, parallel universes), in new technologies (crowdfunding, DIY filmmaking) and in art & architecture (focusing on the the 5 cities) – and all this both locally and nationally in relevant cases. I had written several template e-mails with different angles to focus on depending on the journalist, and written a press kit both in English and in French to send to them (containing pictures, production notes, interviews, etc.). In the end, I had a full list of contacts and content to e-mail once the campaign was launched. ​And then finally, on March 1, 2018, everything was ready and I launched the Kickstarter campaign. I announced it on my Facebook profile and Twitter, as well as on the film’s Facebook and Instagram pages, and for the first day focused solely on spreading the word through my social network, to have a solid first base of “community engagement.” And it did pretty well in terms of Likes and Follows, but I had no pledges. And this is the end-game when it comes to judging whether your Kickstarter campaign is successful or not. I felt a little worried, actually, because it does make you wonder: if people, especially your friends, people who know you and have told you they believe in your project, don’t jump on board and pledge some money - as they more easily would if this was a kitty for my birthday - why should I expect random strangers to do so? To get the ball rolling, I had to literally ask my Dad to be the first pledge, which, honestly, felt terrible. But, I had yet to see what would happen once the press got a hold of it. The second day, I sent out my “press e-mails” to all the contacts on my media list across the five cities, tailoring each time to the individual I was contacting, building my case, presenting the film, the prominent intellectuals in it, why this Kickstarter film was unique, how it brought the 5 cities together, showcasing their art and architecture, etc, etc, etc. I must have sent over 200 e-mails that day. And this is how many responses I got: 0. Whether or not this was to be expected is something I’m still not sure about, but at the time, I was in complete shock. Throughout the first and second week of the campaign, I sent follow-up e-mails, to no avail. The only media I got was a local newspaper in my hometown of Pornichet, France, whose only interest was the fact I was a local boy who had made a movie in the US. I would later get some coverage in Cambridge, MA, as I’ll mention in the next chapter. But not one journalist, from major newspapers in Paris and Los Angeles to obscure art-house blogs in Helsinki and Jerusalem, got back to me. First, the film lacked a celebrity, someone famous outside of the academic field, so it made any entertainment article a tough sell. Second, the journalists didn’t have access to a screener of the film (I wasn’t writing to them to review the film), and so perhaps they felt that writing about a film that wasn’t finished wasn't interesting to them. Third, maybe they were put off by a sense that they were just promoting a Kickstarter campaign (even though I had seen many other articles that were about Kickstarter campaigns). And fourth, which I think is probably the strongest reason: there was no existing buzz around the film. After all, why should they be the first to talk about it? People, and especially journalists, don’t want to be the first to champion a project because they don’t want to end up being the only one to champion a project. What they want is to join a bandwagon. The paradox, however, is obvious: how do you get the train going? I had a wagon, it was just not moving and no one was getting onboard. And in some sense, I get it: if others are talking about a project, then that must mean somehow it’s good. A preexisting buzz is a sign that there’s something worth looking at and helps everyone else sift through all the possible things they could write about and go to what’s actually worth their time. But there’s something wrong with this logic, because buzz isn’t always indicative of quality. There’s a “clique” mentality at work that has little regard, in the end, for the product: what matters is talking about what everybody else is talking about. And if everyone else is saying it’s cool, it must be cool, and I’ll say it’s cool too because if I don't, I'm missing out on the zeitgeist – and what's scary is that if your part of mainstream media and you say that something is cool, that kind of makes it cool. I recently saw a Vice show on Youtube about a journalist, Oobah Butler, who managed to get his restaurant to be the no. 1 rated restaurant in London on Tripadvisor – the only thing is: there was no restaurant. He made it up, engineered fake reviews, met each request for a reservation with the news it was fully booked. Slowly the demand grew and the ratings skyrocketed. This was an amazing stunt, because he had generated interest in a non-existent product, and everyone wanted a piece of it. It was a beautiful example of how appearance, word-of-mouth and hype works and the genuinely disheartening reality of how hard work and quality can be less well rewarded than other manipulative (some may say savvy) strategies. What struck me when watching his story was that if this journalist then actually opened a decent restaurant to fulfill the promise of his illusion, it’s very possible he would have had great success as a business owner (he didn’t do this) – even though to begin with he had nothing. Whatever the moral of the story, clearly I was not equipped to handle the media and promotional aspect of my Kickstarter campaign. I was trying to win a game I had little idea how to actually play. ​Midway through the Kickstarter campaign, I had only raised a third of the target and was starting to lose faith. Most of my pledges were from friends and relatives. I had spent 100 euros on a Facebook ad promoting the campaign, targeting people in Los Angeles and London between 18 and 35 who had liked things such as “Documentaries,” “Philosophy,” or “Daniel Dennett.” From this effort I received about 10 more pledges from "unknowns" (mostly in Italy, go figure), but clearly the fire wasn’t catching. Apparently, most Kickstarter campaigns go through a “plateau” period mid-way through, where engagement teeters out, but this felt like something else: it felt like the peak had been achieved and there was nowhere else to take it barring some sudden miraculous media attention. The example of my use of Twitter is some indication that I was simply in over my head with this whole Kickstarter thing. Like everyone, I started with 0 Twitter followers. I added the few friends of mine who were on Twitter, they followed back – then I created short teaser clips and engaging posts specifically for Twitter, strategically choosing my hashtags (#philosophy, #filmmaker, #diyfilmmaking, #quantumphysics, etc. ), tagging Dennett and Tegmark whenever appropriate, hoping to generate retweets and more followers. Every time I tweeted, I eagerly watched the reaction, hoping to see the numbers and hearts roll. But the only people who see your tweets are those who follow you (I had 4 followers to begin with) and those who check out the dedicated hashtag pages (who are few and far between, at least for my non-trending hashtags). My tweets were getting nothing. I’m not a big Twitter fan to begin with, but my inadequacy to get followers made me feel seriously like my grandparents when they try to use Google maps. One morning I woke up to discover that finally, there was some Twitter activity: my latest tweet, that included a trailer for the film, had been re-tweeted a few dozen times and seen over 2000 times – and counting. At first I thought maybe this was a glitch, but quickly figured out what had happened. 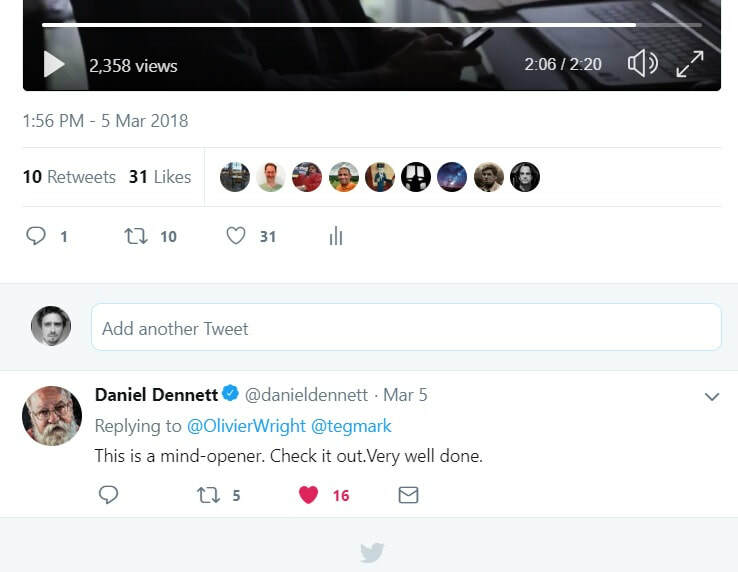 Dennett had tweeted back. I was so happy and pretty amazed how his input had instantly boosted the tweet's visibility. But this little peak fizzled out after a couple days. As I’m writing this several months after the Kickstarter campaign, I still only have 12 Twitter followers. I had obviously not done enough to work Twitter properly, but this is probably in a nutshell a good example of how unprepared I was for the Kickstarter campaign. The final two weeks of the campaign were extremely difficult to manage, as I felt a duty to power on, to keep sending e-mails to journalists and stay positive and confident, all the while feeling every day a little more helpless and frustrated at the lack of progress and the impression of wasting even more time and energy. Every day was like getting pumped up for failure. By the end of the Kickstarter Campaign, I had raised just over a third of the target. But I felt relieved it was over. I could put it behind me and move on.